One of the most recognizable names in the history of chess, Boris Spassky is best known for playing against Bobby Fischer in the 1972 “Match of the Century” for the World Championship title. Among the first players to have a truly “universal” style of play, Spassky was incredibly difficult to prepare for due to his wide variety of openings and equally excellent play in all phases of the game. Still alive today, the past battles between Spassky and his opponents are some of the best games in history to analyze and learn from. 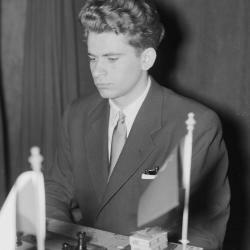 Boris Spassky learned to play chess at 5 years old. He first gained notice from other people when he defeated Mikhail Botvinnik in a simultaneous exhibition game when he was 10 years old. When he was 16 he became an International Master and when he was 18 he became a Grandmaster. Later in his career, he ran into a roadblock and had trouble qualifying for the World Championship match but he was able to break out of this slump and once he switched coaches he had a resurgence. Spassky first played for the World Championship in 1966 against Tigran Petrosian. He lost the match this first time, but in his rematch in 1969 he proved victorious and became the 10th World Champion. His match to defend his title against Bobby Fischer in 1972 is the most memorable chess match in history for it’s surrounding stories and because of Fischer’s incredible play leading up to the match. Spassky lost to Fischer and ceded the title to him. Even though he never got another chance to play for the World Championship, he has continued to be a very strong player throughout the rest of his life so far, winning multiple tournaments. Although he doesn’t play chess much anymore at his old age, his legacy still lives on through the numerous games he played in the past, as well as the openings he helped to innovate.